Renowned NBA star, Lebron James and his company, Springhill Entertainment are taking the athletes talents to Burbank. James and his company, which he and his manager and friend Maverick Carter co-founded in 2013, are forming a production partnership with Time Warner Inc.’s Warner Bros Entertainment. This partnership pairs the world’s No.1 basketball star with the largest television and movie studio, which is based in Burbank, Calif. The agreement will span movies, television, and other digital content. In addition, this agreement will provide James a home to build his entertainment aspirations and award him with global reach and brand expansion. Warner Bros. Chief Executive Kevin Tsujihara recently spoke on the LeBron deal and assured the public that “this is not a vanity deal.” Tsujihara also stated that “Warner Bros. always needs to be thinking about bringing fresh perspectives and diverse voices into the company” and it is clear that every party should benefit from their combined unique visions. This alliance between the two super organizations will also see co-production and co-ownership on every collaboration, as well as Warner Bros. likely holding the copyright of any SpringHill content made as part of the agreement while SpringHill will share in the profits. This, however, is speculation at the moment and has yet to be confirmed by either side. “To be able to partner with Warner Bros. will allow me to do some things I’ve always dreamed of,” said James, who has admitted in the past that he’s a longtime movie buff that used to fantasize about being Batman. SpringHill already produces a variety of television shows, such as Bleacher Report’s “Uninterrupted”, a online web series that showcases various athletes’ lives (including James) off the court; and had been shopping around for a studio partnership for several months. The company also includes the comedy series “Survivor’s Remorse” that airs on the premium cable channel Starz and the DisneyXD show, “Becoming,” on its roster and is in the process of creating a game show that will air on NBC. The deal comes fresh off the heels of James co-starring in the popular romantic comedy, “Trainwreck” starring comedienne Amy Schumer and SNL alum Bill Hader. The Judd Apatow (“Knocked Up”, “The 40-Year-Old Virgin”) film was released on July 17th. Initial projections had the film opening to around $20 million but, through its opening weekend, it ended up grossing over $30 million from 3,158 theaters, exceeding expectations. James’ well-received performance, along with the Warner Bros. deal, has increased speculation that the four-time MVP could move from Cleveland to Tune Land and star in a sequel to the Warner Bros. cult-classic Space Jam, released in 1996 with legend Michael Jordan at the forefront. Warner Bros. has declined to comment on the rumors but, with their recent filing to renew the “Space Jam” trademark in June and the flick’s 20-year anniversary soon approaching, this rumor won’t go away anytime soon. 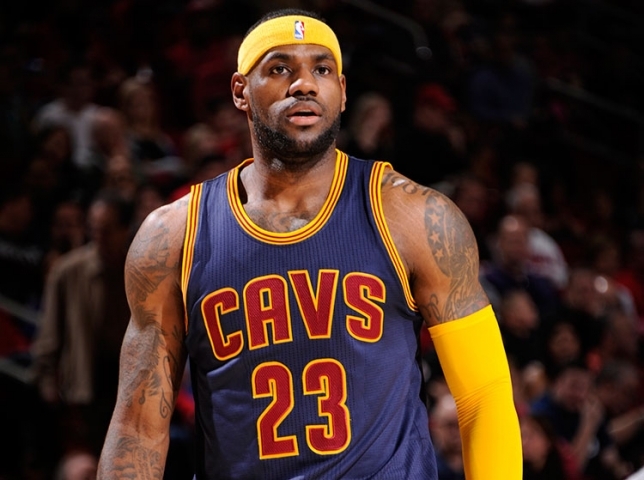 Fans young and old will have to wait for the final word on this potential endeavor but, for now, they can all “witness” King James continue to leave a lasting legacy and become the most marketable name possibly of all-time, which would be a huge accomplishment for the 30-year old who’s really “just a kid from Akron”. 26 Jul 2015 26 Jul 2015 hamptonscriptLebron James, Maverick Carter, Springhill Entertainment, Time Warner, Warner Bros Entertainment, Warner Bros.